It took me a long time to really understand the essentials of making and maintaining a hydroponic nutrient solution. If you want to get a better understanding of one of the most important aspects of growing plants with hydroponics, read on and I’ll tell you all you need to know. Whether you intend to use pre-mixed nutrient solutions or prepare your own from the start, I hope you’ll find this article useful. Providing nutrients to hydroponic plants is a more complicated procedure than fertilizing plants growing in soil. However, a hydroponic nutrient solution allows you to perfectly tailor the delivery of nutrients and optimize the growth of your plants. The good thing about learning about hydroponic nutrient solutions, is that once you understand the basics, you can apply the same techniques no matter what plant you’re growing. By understanding the fundamentals, you will be able to adjust your nutrients solutions to deal with any problems that arise. Growing plants without soil means that the nutrients that are naturally available in soil are not available to be used by the plants. The only way that hydroponic plants can obtain nutrients is through the water and nutrient solution that is provided to them in the hydroponic system. Off-the-shelf fertilizer solutions designed for plants growing in soil will not suffice for hydroponic plants. The reason for this is that soil contains a wide variety of trace nutrients that plants can use, so traditional fertilizers often do not contain these. When growing plants with hydroponics, you must provide everything that your plant needs to grow or you will run into problems that will cause your plants to struggle or become unhealthy. The best way to think about hydroponic nutrients is to divide them up into macronutrients and micronutrients. The three nutrients that every plant needs in the highest quantities are nitrogen, phosphorus, and potassium. You will need a different quantity and proportion of these three nutrients depending on what plant you’re trying to grow. Any fertilizer product will list the NPK ratio which will help you pick the correct fertilizer. Each nutrient has a different role within the growing plant. 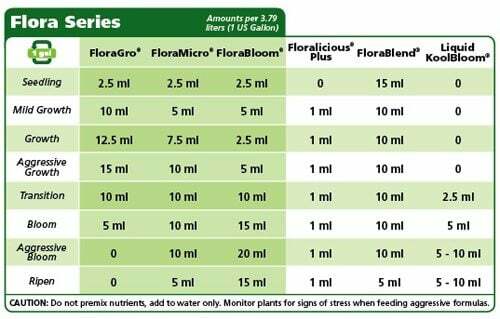 Plants will need greater or lesser amounts of these nutrients at different stages of their growth and it is important to adjust the nutrient mix for your plants as they develop. It is useful to think of plant nutrients as a team, working together to help your plants to grow. Similar to a team, if there is one member missing, it will put your plants at a major disadvantage and they will stand little chance of success. In addition to the nutrients that plants obtain via their roots, they also have a need for carbon, hydrogen and oxygen. These are obtained from water absorbed by the roots and carbon dioxide absorbed by the leaves of the plant. In one of the most important biological processes in the world, plants utilise photosynthesis to store solar energy from the sun in high energy carbohydrate molecules. Carbon dioxide and water are used as reactants in this process to produce the carbohydrate molecules which the plants needs to store energy. Oxygen is a waste product of this reaction and is released into the environment. The chemical equation for photosynthesis is 6CO2+6H2O→C6H12O6+6O2. The remainder of the nutrients which a plant needs to grow and thrive must be obtained by absorbing them through the roots. This is why it is so essential in hydroponics to supply the right balance and quantities of nutrients in the nutrient solution. Nitrogen is one of the most important nutrients that a plant needs for healthy growth. Nitrogen is essential to make plants grow to their full potential and for the formation of leaves and stems. Nitrogen is significantly more active in younger, more actively growing parts of the plants such as buds and shoots. Nitrogen deficiency can be identified by yellowing of the older leaves of the plant and when new shoots and leaves look unhealthy, yellow and weak. Excessive nitrogen can also cause problems, such as impaired growth and an inability to produce fruit or flowers in a timely manner. Phosphorus is a hugely important compound for building healthy roots and ensure that flowers and seeds are able to form adequately. This is because phosphorus is an essential component in the energy transport system within the plant. When a plant has a deficiency of phosphorus it’s growth will typically be adversely affected and there can be some changes in the leaves. It is common for leaves to be a darker green color and smaller than normal. Sometimes the leaves can have a red or brown discoloration due to anthocyanin deposition. The plant can also have some yellow discoloration and poor growth, particularly at times when the plant should be growing vigorously, such as in late spring. Potassium is responsible for many plant processes, including the production of ATP, which is a crucially important source of energy for the plant. It is also responsible for activating the stomata within the leaves, that impact the quantity of carbon dioxide that is taken in through the leaves. Potassium is essential to regulate the amount of chlorophyll present within the leaves, which in turn regulates the energy production capacity of the plant. Adequate levels of potassium are very important throughout the entire life cycle of the plant, but they are particularly important during fruit development. The signs of potassium deficiency in plants can include chlorosis of the leaves and abnormal curling and brown discoloration. Plants that have insufficient potassium will also have disappointing fruit and flower production and early dropping of fruit. Excessive potassium can also impact the transportation of other important nutrients including magnesium, nitrogen and potassium. Magnesium is essential for the production of chlorophil, and without it, a plant has a reduced ability to produce energy to grow. Magnesium is also essential for many plant enzymes to function adequately. When a plant has a deficiency of magnesium, it will normally be noticeable on more mature leaves first. One of the tell tale signs is that you will get yellowing of the leaves, but preservation of the color of the veins. This is a sign known as interveinal chlorosis. Magnesium toxicity does not cause any direct issues, but it can affect the uptake of other nutrients, namely potassium and magnesium, which can result in symptoms of deficiency of these nutrients. Calcium has an important function in the structure and production of cell walls. Calcium moves slowly within plants and the highest concentrations will be found in the roots and in older growth. It is for this reason that deficiency is often noticed in younger shoots and leaves first. The edges and tips of leaves will often fail to grow properly and will turn brown and die in the presence of calcium deficiency. The transport of calcium within the plant is by transpiration. This is the process by which water and dissolved nutrients are taken up by the pores in the roots and are transported to the leaves, where excess water is released from the plant through stomata. If there are areas of a plant which have little transpiration, then the transport of calcium to these areas can be impaired and signs of deficiency will develop. Calcium toxicity is rare in plants, but excess calcium does impair the uptake of other nutrients such as potassium and magnesium. Sulfur is an important component of plant proteins and it is also responsible for the formation of root nodules and chlorophyll. The quantity of sulfur in a nutrient supply can also impact the taste and smell of some vegetables. Sulfur is another fairly immobile nutrient, so signs of deficiency will develop in younger and more peripheral parts of a plant first. Sulfur deficiency often presents with slow growth and yellowing of leaves, in a pattern not dissimilar to nitrogen deficiency. Growth is slow but leaves tend to get brittle and stay narrower than normal. Iron has a major role in the production of chlorophil, and therefore, boosting the level of iron to your plants can make them greener and more vibrant in appearance. Deficinecy of iron will leave to interveinal chlorosis, where the leaves will turn yellow or white, but the leaf vein color will be relatively preserved. Raw iron is highly reactive with many other nutrients. Without adding chelated to your nutrient solution, the vast majority of iron would react with and precipitate out of your nutrient solution. For this reason, you should always either add chelates or use a nutrient mix containing chelates, to ensure that your plants receive sufficient iron. Manganese is involved in a wide variety of systems within plants. It is essential for respiration, photosynthesis and nitrogen processing. It is also important in improving root disease resistance and pollen germination. Deficiency symptoms are quite similar to iron deficiency, with interveinal chlorosis and stunted growth being most apparent. pH is also very important for manganese utilization, as manganese will not be available to the plant at a pH of over 6.5. Manganese toxicity is a common concern, particularly in more acidic conditions, where the solubility of manganese, and hence the plant uptake, is significantly increased. Toxicity commonly causes brown discolouration of the edges of leaves and you can also see brown or red spots on more mature foliage. Zinc is only required in very small amounts in plants, but due to it’s role as a catalyst in many important processes, it is disproportionately important as a micronutrient. It acts as a catalyst for protein synthesis and also has an important role in stem elongation and in the regulation of growth of the plant. Zinc deficiency results in necrosis of the peripheries of leaves and curling of leaves. There can also be some yellowing of leaves and poor development of buds. Copper is another important catalyst of numerous chemical processes within plants. It is important for plant metabolism and respiration. Copper deficiency causes dramatic growth stunting and causes new growth to be irregular and take on a dull and wilted appearance. Copper toxicity can be quite disastrous for plants, leading to plant death in severe cases. Excess copper will prevent the uptake of a number of other micronutrients, such as iron and zinc. This can lead to signs of other nutrient deficiencies. Copper excess can cause reduced stem formation and restrict root growth. Boron is needed by plants to produce new cell walls and to enable these cells to successfully divide. Boron is most important for flowering and for fruit production. Boron deficiency leads to stunted stems and roots and can lead to shoot and bud death. Molybdenum is only required in extremely small quantities, but is an important catalyst in the production of a number of proteins. It is also used to convert nitrogen into a form which is usable by the plant to manufacture important amino acids. The signs of deficiency of molybdenum are not unlike those of nitrogen deficiency. Molybdenum is quite mobile within the plant, so there are more widespread signs of deficiency. It can cause marginal chlorosis of the leaves, followed by leaf necrosis. It can also result in misshapen leaves. You have three options when it comes to nutrient solutions. You can either buy a pre-mixed solution, buy a two or three part solution, or make your own from scratch. If you are a beginner or if you only have a small hydroponics setup, I wouldn’t recommend making a hydroponic nutrient solution from scratch. For most people practicing hydroponics at home, I would recommend using a two or three part hydroponic nutrient solution. This will give you flexibility to adjust your nutrients easily to the growth stage and type of your plants. Light intensity, weather, season and temperature. 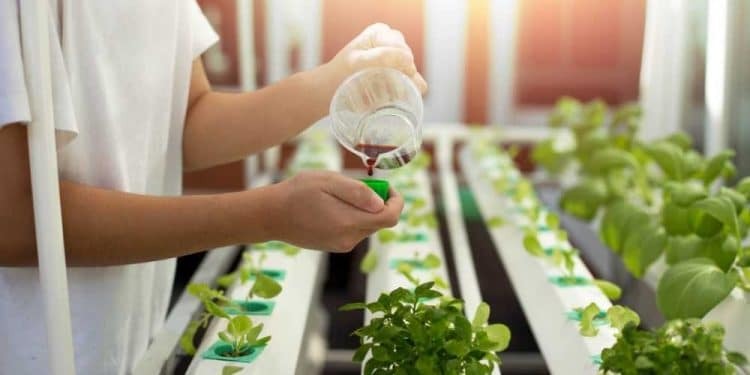 If you decide to opt for a pre-made nutrient solution, the most important thing is to pick a solution that is specifically designed for use with hydroponic plants. The reason is that fertilizers designed for use with soil grown plants will lack many of the micronutrients which are already present in soil. If you use one of these fertilizers in a hydroponics setup, your plants will quickly develop symptoms of deficiency and you will be left disappointed with the growth of your plants. My second piece of advice is to use liquid based fertilizers, as these will mix and dissolve in water much easier and cause less problems than solid fertilizer options. My third recommendation is to use a two or three part solution, so that you can use variable quantities of the liquids to adjust the proportions of nutrients to tailor the nutrient solution to the particular plants you are growing and to the stage of growth that your plants are at. This will also make things easier to adjust in between fresh nutrient solution batches. Electrical conductivity (EC) is an indirect way of measuring the concentration of your nutrient solution. An EC meter will measure the electrical conductivity of the solution. This reading is then converted into a measure of the total dissolved solids in PPM (parts per million). An EC meter can be very helpful to ensure that your nutrient solution is made to the correct concentration and remains at this level over time. It will help prevent your nutrient solution from getting too concentrated. As plants absorb water by osmosis, they rely on water moving from a less concentrated solution to a more concentrated solution. If your nutrient solution becomes sufficiently concentrated, your plants will struggle to obtain water by osmosis and can become physiologically dry. An EC meter is an essential piece of equipment for anyone who is doing anything more than very casual hydroponics. It will help you accurately prepare your nutrient solutions and will help you to monitor it’s concentration, dilute it as required and decide when it is best to make a new batch up. Whilst an EC meter can tell you the electrical conductivity of a solution and in turn the PPM of the solution, it cannot tell you anything about the constituent nutrients dissolved in the solution. Even though your EC meter may indicate an appropriately concentrated nutrient solution, you may not have any idea about whether the solution will be harmful or helpful for your plants. This is a problem which is a particular issue in hard water areas, where a significant proportion of the PPM of your nutrient solution, may be the result of unknown dissolved solids. This is why it is best to start with water that has as close to 0 PPM total dissolved solids when making up a nutrient solution for hydroponics. you would have no idea about. Another issue is that there are many nutrients within a hydroponics nutrient solution which are not absorbed in high quantities by plants and will slowly accumulate in your solution, causing the nutrient proportions to deviate further and further from the desired levels, the longer it is since your nutrient solution was made up from scratch. The optimal pH level to grow plants within a hydroponic system is normally between 5.5 and 6.3, depending on the individual plant. Every nutrient is absorbed by plants at a greater or lesser rate depending on the pH of the nutrient solution. If the pH level falls much below 5.5, the plant runs the risk of deficiency of certain nutrients and toxicity from others, as the rate of absorption changes rapidly. At a pH level of 5, copper and iron are absorbed at an increased rate, but the absorption of calcium and magnesium are greatly impaired. As a result, the plant is likely to suffer from the effects of magnesium and calcium deficiency, whilst being at great risk of copper and iron overload. At the other end of the spectrum, as the pH rises, there will be increased precipitation of a number of micronutrients out of the nutrient solution. This can lead to rapid development of deficiency states in a number of nutrients such as iron. It is very important to monitor the pH of a hydroponics solution on a very frequent basis. As the plants will constantly be absorbing nutrients from the solution, the pH will be changing over time and it is important to buffer and adjust this to ensure that the pH stays in the desired range. There are three main options for checking the pH level of your hydroponic solution. The first is to use pH testing paper. This is inexpensive and simple, but is not the most accurate way of testing pH as the color of the testing strips can be hard to compare accurately to the control. The second is to use a pH sensitive solution. You simply add a few drops of the pH test solution to a small sample of your hydroponic nutrient solution and it will change color. You can compare this to the control strip to determine the pH. While this is slightly more expensive that pH testing paper, it is still fairly cheap and is more accurate and reliable. The third way is to get a pH testing meter. These tend to be very accurate, easy to use and very accurate. The downside is they need to be calibrated to ensure their prolonged accuracy and are prone to failure. Personally, I like to use an electric pH testing meter as it’s so quick to use and saves me a minute or two every time I need to check my nutrient solution. There are a number of options to enable you to adjust the pH of your hydroponic nutrient solution. My personal choices are phosphoric acid and potassium hydroxide to raise and lower the pH respectively. Other options to lower the pH are citric acid, nitric acid and sulfuric acid. Although it is an easy process to adjust the pH of your hydroponic nutrient solution, you must be careful as both these chemicals can cause bad burns if they come in contact with skin. You should always wear eye protection as contact with the eyes could even result in blindness. The other option to adjust the pH is to buy ready made pH adjustment solutions. These are typically a bit less dangerous and will work just as well, although are typically more expensive. When making up a batch of nutrient solution, it is advisable to add your nutrients to the water first and adjust the pH afterwards, rather than trying to adjust the pH as you go along. You are always better to adjust in small amounts and test often, rather that making the pH yo-yo up and down by being too h=generous with your pH adjusters. Don’t forget that the pH is likely to rise over time as the nutrients are absorbed by the plants. 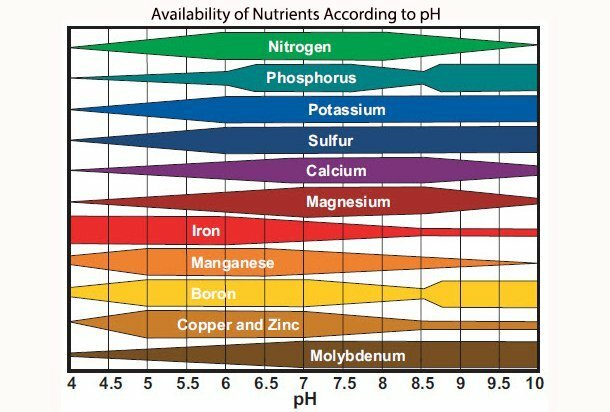 This is one of the reasons that you should frequently measure the pH of your nutrient solution and adjust the pH back to the desired level. The characteristics of your starting water are crucial when making up a hydroponics nutrient solution. As mentioned previously, water with a high level of total dissolved solids, or very hard water, will cause a whole host of problems by limiting the amount of nutrients you can add to your solution and interacting with the nutrients that you do add. I would strongly recommend testing the hardness of your water with an EC meter before making up a hydroponic nutrient solution. I would also strongly advise contacting your water company to get access to the most recent water quality test results, so that you know the starting parameters of your water. You can also pay to have a sample of your water tested by a private lab, which will tell you exactly what is in the water coming out of your tap, rather than a regional water report, which is what you will get from a water company. If you have hard water in your area, of above 120 PPM, you may wish to consider modifying the water prior to using it in a hydroponic system. For starters, you will definitely want to set any water aside that you intend to use for making up a hydroponic nutrient solution for at least 24 hours in direct sunlight to allow the chlorine present to react and evaporate out of the water. Secondly, you may wish to run the water through an activated carbon filter to remove any remaining chloramine and reduce the PPM of the water to a more acceptable level. Thirdly, you may wish to reduce the PPM of the water further by one of the following methods. 1. Use a reverse osmosis filter to remove the vast majority of total dissolved solids from your water, or using distilled water. A reverse osmosis filter is not excessively expensive, but you may not want to go down this route if you are running a very small hydroponics system. 2. Use distilled water. You could consider purchasing distilled water or making it at home to put in your hydroponics system. This will have very close to 0 PPM of TDS and would be ideal for making a hydroponic nutrient solution. The downside is it is inconvenient to purchase this every time you need to make a new solution, and the cost would mount up over time. 3. A compromise, would be to mix some distilled water into your own filtered tap water, to bring the PPM count down to an acceptable level, where the impact of existing dissolved solids will be fairly insignificant. Leave the water to stand in direct sunlight for at least 24 hours to allow the chlorine to dissipate from the water. This will also allow the water to rise to room temperature. An ideal temperature for hydroponic solutions is about 63 to 72 °F. Check the PPM count and pH of the water. If the PPM count is more than 120 PPM, consider lowering this by either adding distilled water or running the water through a reverse osmosis filter or activated carbon filter. Before adding any nutrients to your water, consider the growth stage of your plants and determine an appropriate concentration and nutrient composition for your nutrient solution. General Hydroponics have some great resources on their website to give you a guide. I often use this and other resources as I find it difficult to keep all the information in my head. I also use their nutrient solutions as I have found them reliable over a number of years. Add your chosen nutrients as per your planned proportions. If you are adding individual nutrients to your solution, start with the micronutrients, followed by the macronutrients. Otherwise, simply follow the instructions provided by your nutrient solution manufacturer. Using your EC meter, monitor the concentration several times as you are making the solution up, so that you don’t overshoot and make the solution too strong. Once you have added all of the nutrients, the next step is to check the pH of the nutrient solution. This is done with your chosen pH monitoring method. For me, it’s an electric pH monitor. It is likely that your pH level will have risen above the target range. Mine usually does when making up a nutrient solution. In this example, you should dilute a small amount of phosphoric acid or pH DOWN in about one litre of water. pH adjustment solutions tend to be very strong and is very easy to cause the pH to go from being too high to way too low with only a small volume of acid. By diluting the acid, you can more finely adjust the pH. Once you have adjusted the solution to the correct pH, you can add the solution to your hydroponic system.